1) (Gadesbridge, co. Hertford, granted 1765). Vert a fesse embattled or, betw. two pheons in chief points downwards and in base two human thigh bones in saltier ar. The thigh bones were given in 1761 to show the descent from the Newton family, whose ensigns were sa. two shin bones in saltier ar. On the ancient monuments of the Cooper family appear the coat they previously bore of per fesse embattled ar. and sa. three pheons’ heads counterchanged. Crest—Out of a mural crown ar. a demi spear erect ppr. fringed or, pointed ar. surmounted of two palm branches in saltier vert. Motto—Nil magnum nisi bonum. 2) (Walcot, Somerset, bart., created 1828, extinct sama year). Or, on a bend az. betw. two lions’ heads erased gu. three unicorns’ heads erased ar. Crest—On a mount a unicorn sejant ar. in front of two tilting spears in saltire or. 3) (Woolhara, New South Wales, bart., and also of Bolton-le-Moors, co. Lancaster). Az. a chev. engr. betw. two lions pass. in chief and an estoile of eight points in base or. Crest—A lion sejant or, collared az. supporting with the dexter paw a lance erect ppr. and suspended therefrom by a chain gold an escocheon, also az. charged with a star, as in the arms. Motto—Perseverantia omnia vincit. 4) (West Rasin, near Market Rasin, co. Lincoln). Az. three forks (dung forks) or. Crest—On a ducal coronet or, a war horse pass. ar. saddled and bridled gu. 5) (Bray, co. Berks). Az. a saltire or, on a chief of the last two chevs. paleways point to point of the first. Crest—On a wheat sheaf a pelican vuIning herself ppr. 6) (Wimborne St. Giles, co. Dorset). Ar. three bulls pass. sa. armed or. Crest—On a chapeau gu. turned up erm. a bull pass. sa. ducally gorged or. 7) (co. Gloucester). Az. a saltire or, on a chief of the last three lions ramp. of the first. Crest—On a mural coronet a pelican vulning herself ppr. 8) (Colne-Green, co. Hereford, Ratling Court, co. Kent, and Stroud, co. Sussex). Ar. three martlets gu. on a chief engr. of the second as many annulets or. Crest—A lion’s gamb erect and erased or, holding a. branch vert fructed gu. 9) (Ditcham, co. Hants). Quarterly, ar. and gu. in the second and third quarters, a pheon of the first and a crescent sa. in the first quarter for diff. 10) (London). Az. a saltire engr. betw. four trefoils slipped or, on a chief ar. three dolphins embowed of the first. Crest—A lion’s head ar. erased gu. gorged with a chaplet of laurel vert. 11) (Pains Hill, Surrey). Gu. on a chev. betw. three lions pass. ar. three lozenges of the field. Crest—A lion sejant holding a battle axe in pale, all ppr. 12) (co. Warwick). Ar. on a bend engr. betw. two lions ramp. sa. langued and armed gu. three plates. 13) (Carneford, co. Lancaster, 1664). Ar. on a bend engr. betw. two lions ramp. sa. three plates. Crest—A cockatrice’s head. 14) (Hackesworth. co. Nottingham). Or, a bend az. betw. two lions’ heads erased gu. Crest—On a mount vert a unicorn sejant ar. armed and crined or, supporting a broken tilting spear of the last. 15) (Thurgarton, co. Notts; Thomas Cooper, of that place, in 1569, in. Elenor, dau. of Sir Michael Stanhope, of Shelford. He was son and heir of William Cooper, of the same, by Cicely his wife, dau. and heir of John Tolley, of London. Visit. Notts). Az. on a chev. engr. ar. betw. three cinquefoils erm. two lions respectant sa. quartering Tolley. Crest—A demi man, his dress divided quarterly and counterchanged ar. and sa., sleeves slashed, and holding in his dexter hand a covered cup gold, face swart, wreathed round the temples or and az., on his head a cap of the last. 16) (Thurgarton Priory, co. Nottingham). Az. on a chev. engr. ar. betw. three cinquefoils erminois two lions counterpass. sa. Crest—A demi man, face and hands ppr., his dress divided quarterly and counterchanged ar. and sa., his sleeves slashed, wreathed round the temples or and az. and wearing upon his head a cap of the last, charged on the breast with a cinquefoil erminois and holding in his dexter hand a covered cup gold. 17) (co. Salop). Ar. three martlets gu. on a chief of the second as many annulets or. 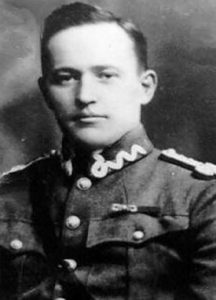 18) (Richard Cooper, gent., of London, son of Richard Cooper, Esq., of Madeley, co. Salop. Visit. London, 1568). Same Arms, chief engr. Crest—A lion’s gamb erect or, holding a branch vert fructed gu. 19) (Surrey). Sa. a chev. wavy erm. betw. three lions ramp. or. 20) (Trowbridge, co. Wilts, granted 1721). Or, a saltire az. on a chief of the second three leopards’ heads guard. couped of the first spotted sa. and ducally crowned ar. Crest—A demi leopard guard, ppr. ducally crowned ar. holding in the dexter paw a holly branch vert fructed ppr. 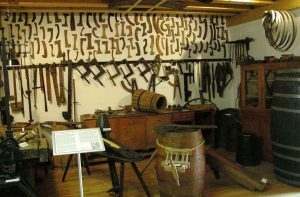 21) (Winchester, 1584). Az. a fesse betw. three pelicans ar. vulning themselves gu. 22) (Toddington Park, co. Bedford, and Park House, Highgate, co. Middlesex, descended from co. Chester). Gu. on a chev. betw. three lions pass. ar. each holding a battle-axe in his fore paw or, three lozenges sa. on a chief engr. of the third a lozenge of the field betw. two martlets of the fourth, an escutcheon of pretence quarterly gu. and az. on a chev. enn. betw, three lions pass. or, as many mascles of the first. Crest—On a gazon vert a lion sejant or, holding in his dexter paw a battle-axe and in the sinister a tilting spear, all ppr. Motto—Tuum est. 23) Az. a tortoise erect or. 24) (Wortlington House, co. Suffolk). Ar. a chev. gu. charged with another arm. betw. three sprigs of laurel, each consisting of three leaves vert. Crest—A cubit arm erect holding two branches of laurel (disposed orlewise) ppr. Motto (over thc crest)—Virtuto. 26) Ar. a chev. sa. betw. three doves ppr. Crest—A dove with an olive branch in its beak, all ppr. 27) Ar. three greyhounds courant in pale sa. Crest—A greyhound sejant sa. 28) Ar. a chev. ermines cottised gu. betw. three leaves vert. Crest—A cubit arm erect ppr. holding up a chaplet vert. 29) (Durham). Gu. a bend erm. betw. six lions ramp. or. Crest—Issuant from a tower the head of a Moorish king wreathed and chained, all ppr. 30) (granted to Robert Chester Cooper, Esq., Lewes, Sussex). Gu. on a chev. dovetailed ar. betw. two bucks’ heads cabossed in chief and a garb in base or, three martlets az. Crest—On a mount vert a lion pass. guard. or, the dexter fore paw resting on an escutcheon gu. charged with a leopard’s face gold. 31) (Bulwell, co. Nottingham, granted to the late Samuel Thomas Cooper, of Bulwell). Az. on a chev. engr. or, betw. two lions pass. in chief ar. and a griffin’s head erased in base of the second, three gads or square plates of steel ppr. Crest—On a mount vert in front of two battle-axes in saltire or, headed ar. a lion sejant ppr. collared of the second supporting with his dexter paw a gad or square plate of steel ppr. 32) (Fun. Ent. of Capt. Thomas Cooper, d. 20 Nov. 1665). Ar. on a bend engr. betw. two lions ramp. sa. three plates. Crest—A cockatrice head erased or, guttee de poix, armed, beaked, crested, and jelloped gu. 33) (Markree Castle, co. Sligo). Quarterly, 1st, az. on a chev. betw. three cinquefoils or, two lions pass. respecting each other sa. ; 2nd, ar. a chev. engr. betw. three martlets az. ; 3rd, az. three millstones ppr., for Synge; 4th, ar. an eagle displ. with two heads sa., beaked and legged gu., also for Synge. Crest—A demi man affronte habited per pale ar. and sa., in the dexter hand ppr. a covered cup or, on the head wreathed round the temples ar. and az. a cap gu. Motto—Deo patria rege. 34) (Killenure, co. Tipperary). Sa. a chev. wavy erm. betw. three lions ramp. or. Crest—On a chapeau gu. turned up. erm. a bull pass. ppr. collared and hoofed or. Motto—Love, serve. 35) (exemplified 1844 to James Cooper Tothill, Esq., of Merrion Square, Dublin, on his assuming by royal licence the name and arms of Cooper only, in compliance with the will of his relative, Honora, relict of James Cooper, of Cooper Hill, co. Limerick). Sa. a fess wavy erm. betw. three lions ramp. or. Crest—A demi lion ramp. or. Motto—Noli irritare leonem. 36) (Failford, co. Ayr). Ar. on a bend engr. betw. two lions ramp. gu. three crescents of the field, all within a bordure chequy ar. and az. Crest—An oak tree with a branch borne down by a weight ppr. Motto—Resurgo. 37) Gu. three stags’ heads erased ar. attired or, on a canton of the second a chev. of the first charged with three plates betw. as many pears ppr. Crests—1st, an escallop or; 2nd, a cormorant, wings endorsed, bolding in the beak a fish all ppr. Motto: Non parvum est teipsum noscere. 38) (Samuel Joshua Cooper, Esq., of Mount Vernon, near Barnsley, co. York). Per pale pean, and gu. on a chev. betw. three lions statant ar. an estoile betw. two lozenges of the second. Crest—On a mount vert a lion sejant pean, holding in bis dexter paw a battle axe, erect, or. Motto—Tout vient de Dieu. This is an English occupational surname meaning “the cooper”, which was a person who made tubs, casks, vats, buckets, and barrels. This was a very common early trade name and an important craft during medieval times. It derives from the Old English word coper, itself derived from the Cyprian word cyprium meaning “bronze”, which likely confirms that trade existed between the near East and Britannica before the Christian era. Another source states it derives from the Middle Dutch word kuper, which means “tub” or “container”. One source asserts the family was first found in county Sussex. There is also a town in Fifeshire, Scotland named Cupar, which is derived from Cu-pyre, meaning the inclosed fire, or co (high, a beacon fire or signal on the coast for ships) and pyre (a beacon fire on a high place). It is related to the word pier, a wharf or landing place for ships. The Danish word pyr or fyr means a lantern. Hence, it is possible the name also has locational origins. Common spelling variants or names with similar etymologies include Couper, Cupper, Cowper, and Copper. It can be an Americanized form of the Ashkenazic Jewish surname Kupper of Kupfer. Foreign names with similar origins include Cuyper (Dutch) and Kupper (Flemish). In Holland, the name was first recorded in Decenter, Overyessel. The last name ranks Cooke ranks 64th in popularity in terms in the United Status as of the 2000 Census. The name ranks particularly high in the following six states: Georgia, Michigan, South Carolina, Indiana, Maryland, Delaware, and West Virginia. The surname is even more common in England, where it ranks 35th. It ranks highest in the following counties: Hampshire, Staffordshire, Norfolk, Bedfordshire, and Huntingdonshire. The name is common throughout the English speaking world: Scotland (110th), Wales (67th), Ireland (540th), Canada (108th), New Zealand (31st), Australia (43rd), and South Africa (400th). The 1890 book Homes of Family Names by H.B. Guppy, states the following in regard to this surname: “Distributed over the greater part of England, but rare or absent in the northern and south-western counties. It seems to have three principal centres, one in the northern midlands, including Cheshire, another in Sussex and Hants, and a third in Suffolk. The counties especially notable for Coopers are Cheshire, Derbyshire, Hants, Leicestershire and Rutland, Notts, Suffolk, Sussex, Warwickshire, and Worcestershire”. The earliest known bearer of this surname was Robert le Cupere who was documented in the Pipe Rolls of Sussex in 1176 AD. A one Selide le Copere was recorded in Norfolk in 1181 AD and John Copper was recorded in the Friary Rolls of York in 1424 AD. The Hundred Rolls of 1273 AD, a census of Wales and England, known in Latin as Rotuli Hundredorum lists four bearers of this surname: Alan le Cupere in county Cambridgeshire, Henry le Cupper in county Notts, Richard le Cupare in county Oxfordshire, and Jordan le Cupere in county Oxfordshire. The Poll Tax of Yorkshire in 1379 AD lists one bearer of this last name: Willelmus Couper. The History of Norfolk (by Blomefield and Parkin) documents one Robert Cupper, bailiff of Yarmouth in 1425 AD. An early marriage involving this last name was William Cooper to Winifred Cope at St. Michael Cornhill in London in 1607 AD. The famous genealogist Bernard Burke’s book “The Landed Gentry” discusses five branches of this family: 1) Cooper of Toddington Manor, 2) Cooper of Markree Castle, 3) Cooper of Cooper’s Hill, 4) Cooper of Cooper Hill, Queen’s County, 5) Cooper of Killenure, and 6) Cooper of Failford. Burke’s book also discusses the genealogy of Cowper of Carelton Hall, a family that resides for many generations at Unthank in Skelton, Cumberland, England that is related to the ancient Windor family of Lancashire. 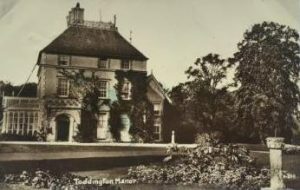 The first branch mentioned begins with a mention of William Cooper Cooper, Esquire of Toddington Manor in county Bedford who was a Justice of the Peace, Deputy Lieutenant, Barrister-at-Law, High Sheriff, and Major Beds Militia. He was born in 1810 and in 1831 he married Laura Georginia, the daughter of Captain Thomas Ellis, and had one son with her named William Smith Cowper. 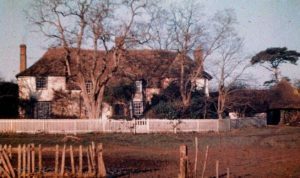 Burke states this family resides originally for many years in Sussex, and this branch dwelled at Boston in county Chester around the year 1377 AD. John Cowper was an Esquire baptized in March of 1593, the son and heir of John Cowper of Bosden. In 1631, he married Mary, daughter and heiress of W.R. Handford, Esq. of Handford Hall, county Chester, and dying 1700, was succeeded by his son, John Cowper. This John married Sarah, daughter and heir of Walter Copestick of Langley Park, and had children with her: John (married Hannah, daughter of Thomas Strettell and had three issue with her), Elizabeth (married William Dale of Handford), and Hannah (married Sir Thomas Banastre). He was succeeded by his elder grandson John Cooper. The Cooper Family Crest has the following blazon in heraldry: Gules, on a chevron between three lions passant argent, each holding a battle-axe in his forepaw or, three lozenges sable, on a chief engrailed gold a lozenge of the field between two martlets of the fourth. The second branch discussed begins with a mention of Edward Henry Cooper, Esquire of Markree Castle in county Sligo, Lord Lieutenant of said county, Justice of the Peace, and High Sheriff in 1871. He was also Lieutenant Colonel Grenadier Guards and a member of Parliament in county Sligo from 1865-68. He was born in 1827, who married, in 1858, Charlotte Maria, daughter of Edward Wheler Mills, youngest son of William Mills, of Bisterne, Hants, and had issue with her: Francis Edward (1859), Richard Joshua (1860), Kathleen Emily (1861), Arthur Charles (1864), and Florence Lucy (1864). Burke traces the genealogy or ancestry of this family back to Edward Cooper, Esq. a Cornet in his cousin Richard, Lord Colooney’s regiment of Dragoons who settled in Ireland and owned a great estate there. He married Margaret, daughter of Nicholas Mahon of Ballinamulty, and had children with her: Edward, Arthur, Richard, Mary (married George Ormsby of Lough Mask), and Margaret (married Gustavus Hamilton). His son Arthur was Esquire of Markree in county Sligo. In 1693, he married Mary, daughter of Sir Joshua Allen, and had issue with her including his heir Joshua. Joshua was also an Esquire of Markree and in 1729 he married Mary, daughter of Richard Bingham, and had issue with her. His eldest son was the Right Honorable Joshua Cooper of Marktree. He was a member of Parliament for county Sligo and of the Privy Council in Ireland. He married Alice, daughter of Edward Synge, Bishop of Elphim, and had four children with her: Joshua, Edward Synge, Richard, and Jane. His grandson Joshua was an Esquire of Marktree and a Member of Parliament for that county as well. He married Sarah Frances, daughter of Owne Wynne, with whom he had the following issue: Laura Francis (married Arthur Warre), Charlotte Sophie, Emma Marie (married Henry Eastwood), Selina Elizabeth, Cecily Florence (married Richard Augustus). He died in 1863 and was succeeded by his nephew, Lieutenant Colonel Edward Henry Cooper (mentioned at the beginning of this paragraph). The Cooper Coat of arms is blazoned as follows: Quarterly, 1st, azure on a chevron, between three cinquefouls or, two lions passant respecting each other sable, 2nd argent, a chevron engrailed between three martlets azure, 3rd azure, three millstones proper, 4th argent, an eagle displayed with two heads sable beaked and legged gules. The third branch begins with a mention of James Cooper Cooper, an Esquire of Cooper’s Hill in county Limerick Ireland who Justice of the Peace born in 1825. In 1847, he married Mary, daughter of Charles Pickering, Esq. of Roebuck in county Dublin and had fifteen issue with her: Christopher (1849), Charles (1854), James (1865), Robert (1866), John (1869), Jane (1874), Grace (1868, married Thomas William Gribble), Bridget (married Richard Knight Prichard), Honora (married W.H.F. Palmer, Esq. ), Mary (married George R. Taylor), Sarah, Rachel, Elizabeth, Susan, and Ruth. He was authotized by royal license in 1844 to take the name and arms of Cooper in place of those of Tuthill. The lineage is traced back to Christopher Tuthill, Esq. and Lieutenant in the Royal Navy of Islanduane, son of Richard and Mary Dickson. The fourth branch discussed is Cooper of Cooper Hill in Queen’s County, which begins with a mention of Reverend Robert Cooper of Cooper Hill, an M.A. of Trinity College Dublin. He was born in 1802 and was Lord of the Manor of Dysart-Gallen in Queen’s County. In 1838, he married Isabella Alicia Maria, daughter of William Augustus Le Hunte, Esq. of Artramont in county Wexford, and had five issue with her: William Augustus (1839), Edward George (1842), Robert Thomas (1845), Charles Hamlet (1854), and Susan Cope. Burke traces the genealogy or pedigree of this family back to Thomas Cooper of Newtown in county Carlow who died in 1714 and was buried at New Garden. His two sons were William and Edward. Edward was of Sragh in Queen’s County, who in 1697, married Ann, daughter of John Inglefield of Dublin, and had issue with her: Thomas (1699), Thomas (1703), John (1706), William, Elizabeth (1700), Sarah (1701, married Abel Strettell), Ann (married John Penrose of Waterford). His son William was an Esquire of Cooper Hill, alias Sragh who was born in 1709. In 1730, he married Experience, daughter of Abel Strettell, of Dublin, by whom he had issue: Edward, Abel (1734), Thomas (of Mullimast), Lydia (married Robert Clibborne), Ann (1738), and Sarah (married Barclay Clibborne). He died in 1760 and was succeeded by his eldest son, Edward Cooper, Esquire of Cooper Hill. Edward was born in 1733 and in 1754, he married Sarah, daughter of Robert Clibborne of Whelan Grove, and had three children with her: William, Edward, and Ann. He was succeeded by his eldest son William. William was born in 1757 and was High Sheriff in county Carlow in 1793. In 1789, Susan, daughter of William Cope, of Merrion Square, and had issue with her: William Cope, Edward, Robert, Henry, Sarah, Elizabeth, Susan, Anne, Alicia, and Maria Theresa. He was succeeded by his eldest son William Cope Cooper, Esq. of Cooperhill, Justice of the Peace, Deputy Lieutenant, and High Sheriff for Queen’s County 1831. This family was seated at Cooper Hill, Ballicmoyler. 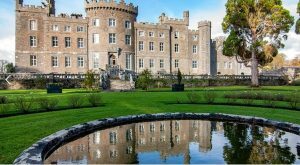 The fifth branch mentioned begins with a mention of Captain Austin Cooper, of Killenure Castle, county Tipperary, Justice of the Peace for that county, who married Minnie, daughter of Rev. 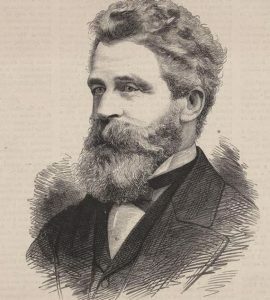 Ogle William Moore, in 1869. He succeeded his brother Samuel in 1877. Burke traces the Cooper genealohy back to Austin Cooper, Esquire, a support of the royal cause who purchased a tract of land from Hammond, a soldier of Oliver Cromwell. He had to forfeit the land and he moved to Ireland in 1661. He married Mary, daughter of Henry Dodson and had six sons and three daughters with her. His second son Austin was born at Hampton Court in 1653. In 1683, he married Susanna, daughter of William Ransford, and left issue with her, including his heir Samuel. Samuel was Esquire of Beamore and born in 1686. He married Dorthea, daughter of William Harrison, and had issue with her: Samuel, William,and John (of Cooperhill in county Meath who married Mary Paget). His son William Cooper, Esquire was born in 1721 and lived at Killensure in 1746. The following here, he married Jane, daughter of Henry Wayland of Kilmore House, and had several issue with her. He died in 1769 and was succeeded by his son Samuel who was born in 1750. In 1769, he married Francis, daughter of Richard Butler, and died in 1831, and was succeeded by his only surviving son, William. William was born in 1772 and was Justice of the Peace. He married Rebecca, daughter of Rev. Richard Chadwick, and had issue with her. His successor was Samuel, Esquire of Killensure, who was born in 1800. This Samuel was Justice of the Peace and an officer of the 2nd Queer’s regiment. In 1829, he married Louisa Salisbury, daughter of Richard Long of Longfield, and had eight children with her: Samuel, Richard, William, Austin, Edward, Astley, Charity (married John Battersby of Bobsville in 1854), and Maria Louisa (married Edward Rotheram in Sallymount in 1866). His eldest son was Samuel who was born in 1829 and became an officer in the 44th regiment, where he served in the Eastern Expedition in 1854. He died in 1877 without posterity and he was succeeded by his brother Austin (mentioned at the beginning of this paragraph). This family bore the following Cooper family crest and coat of arms: Sable, a chevron wavy ermine, between three lions rampant or. The sixth branch of this family discussed in the book begins with a mention of William Cooper, Esquire of Failford, in county Ayr, who was Justice of the Peace, Deputy Lieutenant, and Major Royal Ayr and Wightown Militia. In 1845, he married his second wife, Margaret, daughter of Reverend Doctor Hill of Glasgow, and Margaret Crawfurd of Newfield, and had issue with her: William Samuel (LL.B. Trinity Hall Cambridge, Justice of the Peace, Captain, Ayrshire Yeomanry, born 1846), Alexander Hill, Margaret Crawfurd (married John Bell), Janet Ritchie, and Mary Stewart. Burke asserts this family descends from the Coupers of Gogar in Mid-Lothian. A one William Couper or Cowper was born in 1629 and was an officer in the Dragoons during the Civil War. He married Christian Scott and settled in county Dumbarton. 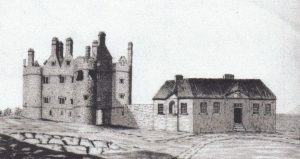 He had issue with her, including John Couper or Cowper, who lived at the Tower of Banheath, county Dumbarton, and married Christian Gray in 1676. His son and successor was John Couper, born in 1677. He married Margaret Thom and had numerous issue with her. The eldest son was Reverend John Couper, born in 1709, who was a clergymen who settled in county Lincoln. He changed his name to Cooper and died without issue, whereupon the representation of the family devolved to his brother William Couper of Smithson and Failford. William was born in 1711 and changed his last name to Cooper. In 1754, he married Mary, daughter of Hugh Steward, and had issue with her. He was succeeded by his eldest surviving son Alexander. Alexander was born in 1765 and held a Comission in the army. He served overseas and was later appointed Cptain Commanding Mauchline Volunteers and Lieutenant Colonel of the 2nd regiment of the Ayrshire Local Mitlita. He died without posterity in 1829 and was succeeded by his brother Samuel. Samuel Cooper was born in 1768 and in 1795 he married Janet, daughter and heiress of Henry Ritchie. He died in 1842 and left numerous children: William, Henry Ritchie (married Mary Jane Butler), Janet Craufurd (married William Wallace of Busbie), Mary, Cecilia (married Robert Struthers), Henrietta (married John Crooks of Levan), Frances (married Herbert Buchanan), Anne (married George Ross Wilsone), Ellinor (married Thomas Gray Scott), and Esther Ritchie (married Alexander Graham Dunlop). The blazon or Cooper Coat of Arms or family crest in heraldry is as follows: Quarterly, 1st argent, on a bend engrailed, between two lions rampant gules, three crescents of the field, all within a bordure chequy, argent and azure, for Cooper; 2nd and 3rd quartered: 1st and 4th, argent, on a chief gules three lion’s head erased of the first all within a bordure ermine, for Ritchie; 2nd and 3rd, gules; a fess ermine and in chief a mullet of the last, for Crauford, 4th argent, a chevron gules surmounted of another ermine betwixth three laurel slips vert, all within a bordure chequy, as the former, for Couper and Cowper. This family is seated as Smithstone House, Tarbolton, Kilmarnock, Ayshire, Scotland. John Cooper the 1st was born around 1458 AD in Arlesey, Bedfordshire, England. He married Joan (last name not known) and had two issue with her: Michael and Thomas. Michael was born in 1480 in the same town and also spelled the surname Cowper. He married Margaret Everre and had issue with her: Edmund, William, Walter, Mary, Lettes, Elizabeth, Alice, Barbara, Winifred, and Michael Jr. Michael Jr. was born in 1519 and he married Elizabeth Page and they had issue: John, Richard, Oliver, George, Edmund, Robert, Agnes, and Judith. His son John was born in 1538 and he married Maria Spear. They had a son named John who was born in 1538. John in turn had a son, also named John. This John was born in 1554 in Hungham, Norfolk, England. He had a son named Thomas (Stephen) Cooper. Thomas was born in 1580 and he went to New Haven, Connecticut. He married Margaret Knight and had a son with her named John. John was born in 1610 in London, Middlesex. He in turn had the following issue: Mary, Hannah (Potter), John Jr., and Sarah (Hemingway). His son John Jr. was born in 1642 in New Haven. He married Mary Woolen and had children with her named Samuel, Joseph, Rebecca (Alling), John, Mary, Mary (Smith), Sarah (Munson), Samuel, and Abigail (Johnson). His son Samuel was born in 1675 in New Haven. He had a son named Samuel as well. This Samuel was born in 1704 in the same town and he had a son also named Samuel. This Samuel was born in 1746 and he married Rachel Ford. They had a son named Issac. Issac Cooper was born in 1776 and he had issue with her. His son Lewis was born in 1803 in New Haven, CT. He married Elizabeth W. Reed and they had a son named Charles Reid. Charles Reid Cooper was born in 1848 in Pennsylvania. He married Mary Denny and they had a son named Alton. Alton was born in 1871 in Harmonsburg, PA. He married Flora Belle Smith and had a son with her named Lewis Reed Cooper who was born in 1913 in the same city. He married Evelyn Zimmerman and had a son with her named William Lewis Cooper. Alexander Cooper was born in 1565 in England. He married Margyrie Rippley and had two issue with her: William and Sampson. William was born in around 1590. He in turn had two issue: William and Rachel. 1) Anthony Cooper of Hingham in 1635 who came to America with his wife, four sons, four daughters, and four servants. 2) Benjamin Cooper of Salem who was of Brampton in the east part of Suffolk in England. He came at the age of 50 in 1637 aboard the Mary Ann with his wife Elizabeth and five children: Lawrence, Mercy, Rebecca, Benjamin, and Francis Fillingham. 4) John Cooper of Lynn who came in 1635 aboard the Hopewell at the age of 41 with his wife and children: Mary, John, Thomas, and Martha. He was from Olney in county Buckshire, was a freeman in 1636. He was one of the purchasers from the Indians for the projectors of the Colony at Southampton, Long Island. 5) John Cooper of Cambridge who came with his sister Lydia. He was a freeman in 1642, and we was deacon and town clerk. He married a woman named Ann, daughter of Nathaniel Sparhawk, and had issue with her: Ann (married Edward Pinson), Mary (1645), Samuel (1654), John (1656), Nathaniel (1659), Lydia (1663), and Hannah (1667). 7) John Cooper of New Haven, 1639, who was an agent for iron works and a reprentative in 1664-7. He had issue Mary (1631), Hannah (1638), Mary (1661, who married John Potter), Sarah (1645, married Samuel Hemenway). 9) John Cooper of Duxbury, 1666. 11) Peter Cooper of Rowley, 1643, who came in 1635 in the Susan and Ellen at the age of 28, and was buried in Rehoboth in 1678. 12) Simon Cooper of Newport, 1663, a physician, married Mary Tucker in 1664. She was likely a daughter of John of Watertown and Hingham. They had children named Robert (1664), Joseph (1667), Mary (1669), and Simon (1672). 14) Thomas Cooper, of Hingham, who came to America aboard the Diligent in 1638, with his wife, two children, and two servants. He was representative in 1643. His second wife was Ann, widow of Zaccheus Bosworth. He was a deacon. 15) Thomas Cooper of Boston who came in 1635 likely aboard the “Christian” at the age of 18 and was probably early at Windsor. He moved to Springfield in 1641 and was a freeman in 1649. He was a lieutenant killed by Indians in 1675. He had a daughter named Rebecca who married John Clark in 1677. 16) Thomas Cooper of Boston who likely married a widow Smith of Watertown. 17) Timothy Cooper of Lynn 1647 who died in 1659. He had sons John (1647) and Timothy (1651) and he had four daughters. Humility Cooper came to America aboard the Mayflower in 1620, but he later returned to England. A one Peter Coop (or Cooper) came to New England aboard the Suzan & Ellin in 1635. A one Anthony Cooper came to Bermuda aboard the Truelove in 1635. A one Ann Cooper came to Virginia aboard the George in 1635.Walter Cooper or Coop was recorded as living in Virginia in February of 1623 9at ye Colledg Land). He came aboard the Jonathan in 1619. A one Justinian Cooper came to Virginia in 1618. Members the Cooper family who settled in America in the eighteenth century include Semi (Virginia 1704), Richard (Virginia 1705), Esther (Virginia 1705), Hannah (Virginia 1726) and Boice (New England 1740). Some of the earliest settlers in Canada bearing the Cooper last name were Francis, George, James, Mary, and Matthew, who arrived in Nova Scotia in 1749. In Australia, three bearers, all convicted convicts, came to New South Wales aboard the Ann in 1809. One of the earliest settlers in New Zealand bearing this name was Thomas Cooper in 1836 who landed in the Bay of Islands. Henry Dodge Cooper was born in Wantage, New Jersey in 1853. He was the Captain of the Regiment N.G.S.N.Y who married Rosalie Marindale, daughter of Alfred Seaman and Anne Sanford, and had two children with her: Dudley Martindale (1884) and Marion Dodge. He bore the following Cooper Coat of Arms: Argent, three bulls passant sable armed or. He was the son of Matthew H. Cooper and Emily Howell. He descended from Tristram Dodge, who came to America in 1700. The following blazon was recorded in Norepaper of Walter I. Cooper of Philadelphia: Argent a chevron sable between three doves proper. The bookplate of Myles Cooper, LL.D., Regis Nov Ebor in America, Praeses is blazoned in heraldry as follows: Gules on a chevron between three argent lozenes gules”. Both of these Cooper Family Crests are recorded in Bolton’s American Armory. 2) Hector Cooper, Risegarth, in Walkinton, Yorkshire Sept 1612 by R. St. George, Clar. 3) James Cooper, Hacksworth, Notts, brother to Barbara, by Cooke, Clar. There are thousands of notable people with the Cooper surname. This page will mention a handful. Famous people with this last name include: 1) Alfred Heaton Cooper (1863-1929) who was an English watercolour artist, 2) Ashley Horace Cooper (1905-1981) who was a member of the Legislative Assembly of Alberta, Canada, 3) Barbara Cooper (1958) who was an officer and Commandant in the Royal Air Force of the United Kingdom, 4) Leroy Gordon Cooper Jr. (1927-2004) who was an American astronaut, test pilot, and aerospace engineering from Oklahoma, 5) Helen Cooper (1946) who was the mayor of Kingston Ontatio in the late 1980s and early 1990s, 6) Merian Caldwell Cooper (1893-1973) who was an American aviator from Florida and was also a Polish Air Force officer and was a Soviet prisoner of war, 7) Milton William Cooper (1943-2001) who was a radio broadcaster and conspiracy theorist, and 8) Paul Fenimore Cooper (1899-1970) who was an American author of children’s books from Albany, New York. Some of the common heraldic symbols in the Cooper Coat of Arms or Cooper “Family Crest” are the lion passant and the saltire. There can be no animal more clearly associated with Heraldry than the lion, majestic King of the Beasts. Originally it appeared only in one pose, erect, on one paw, with the others raised but such was the popularity of this figure, and the need to distinguish arms from each other, that it soon came to be shown in an enormous range of forms. The lion passant is an example of these modified form, showing the creature on all fours, as if walking proudly. In common with all reprensentations of the lion it can be taken to be an “emblem of deathless courage”.